In-depth statistics about the Sacramento area real estate market. In a previous post, I reviewed some stats for the number of vacant homes compared to total listings. Three months later, I figured I'd revisit this topic and see where the numbers were heading. With the exception of Galt, all areas had an increase, some considerably larger than others. Why do we care about vacant homes you ask? It's my opinion that vacant homes put pressure on the owner to either sell quicker or rent it out. Being forced to sell quickly in this market translates into pricing below your competition. In addition, the inventory is rising so this is another factor that puts pressure on the vacancy rates. Plus, new home building is coming online at a time when the market is already saturated with homes. It’ll get interesting this year. Again, the four horsemen of the housing apocalypse are approaching. Southern California will realize how quickly debt service can put you down especially when it is linked to an asset you are unable to sell. How come actual numbers are decreasing and percentage hss gone up. Also how did you determine if they are vacant ??? in the sale listing itself. Then, how many have ommitted that out. Actual number are going to be higher than the number shown. In fact much much higher. anon--The percentage is calculated on BOTH the total number of listings and the number of vacancies. 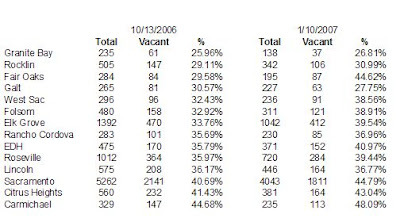 Example: 20 listings and 8 are vacant, that's a 40% vacancy ratio. Now, if we have 10 listings and 5 are vacant, we have a 50% vacancy ratio even though both numbers went down. Make sense? I know that. Its just an interesting trend. That was my point, not how it increased. And yes, the listings indicate whether the homes are vacant. It should be pretty accurate because it's in the "showing instructions" portion of the listing and most realtors have enough sense to get that part right. Is it possible to put together a smiliar chart for other areas? I'm from Sacramento, but I live in SoCal so I'd like to take a crack at putting together some stats for some local communities I've got my eye on. I guess my question is, do you have access to proprietary information, or software or scripts that collect the data automatically, or is this something anyone can do? page, right? Higher priced homes are often vacant because the seller is capable of 1. moving when they want, 2. taking a job transfer, 3. new custom home. Right on! Dat's why ya' need some professional realuhta' likes me. Wid mah' 'espuh't knowledge uh de real estate market and it's trends ya' kin 'espect t'maximize yo' profits! Right on! By de way, all uh de economists and statistics say dat da damn wo'st be behind us and it gots'ta be smood sailin' ahed. Dis summa' is when we is goin' t'see HUGE gains - likes down 8-9% fum where we is now, so cut me some slack, Jack. You's gots'ta steal now o' be left behind. Darnell be de man. 'S coo', bro. He raps de trud. wo'd. Hey Darnell, how can I get in touch with you? I keep reading all of these bad things about the housing market and how prices aren't expected to rebound for several years. If you could just tell me that this isn't true and that everything's okay I'd be happy to buy a house, and I'm sure you'd be happy to help me find one! This is a very real situation and should only get worse before getting better. The number of homes going back to lenders in Sac County last month exceeded 250. This represents the highest number we have seen since the last major correction in the early 90's. Pat attention to these numbers going forward. More foreclosures will surely lead to more price pressure to the downside. I even sold my primary residence just over a year ago anticipating a housing bust.....It is going to get bad......the question is how bad?? By any chance apprx., do you know how low can the real estate market go. Why are the builders still building houses if they knew the market price are going down every month? Still I noticed in Sacto county the new apartment complex are too many, especially in South area. Do we have a lot of renters out there? Where did you get this information? Do you happen to know the current numbers?